The only church in England dedicated to St Deinst, a 6th-century Celtic saint and the first Bishop of Bangor. There was a church at Llangarron at least as early as the 11th century. That Saxon church was re-consecrated under William the Conqueror as 'Lan garan' (Lan being the anglicized version of the Welsh 'Llan', meaning church). 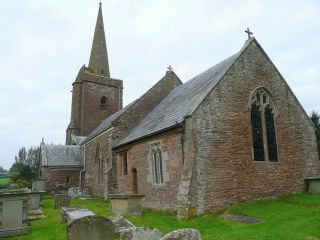 The bulk of the current building is 14th century, which is when the nave, chancel, and west tower were built. A century later the south porch was added. The building was further enlarged by the addition of a north aisle in the 17th century. The interior features a good collection of historic monuments, the earliest dating to the 14th century. The font is among the earliest objects in the church, also dating to the 14th century. This is octagonal and is carved with Perpendicular Gothic motifs, including quatrefoil patterns and fleurons. Even more interesting is the monument known as the Chrisom Child. This small carved figure was once thought to be intended to mark the grave of a young child. However, a new theory is that it is a Saxon memorial stone intended to commemorate the grave of a priest.